Stephen Cox is a native of Early, TX with a passion for music. While attending Howard Payne University he performed on clarinet and saxophone with the university band, jazz band, and a local jazz combo. Upon graduating with a bachelors in Music Education, he served as Director of Bands for the New Braunfels Christian Academy and co-directed their spring musicals. During this time he also performed with the 78s Jazz Combo. Now serving as the middle school band director for Eastland ISD, Stephen also manages the website freemusiced.org. In his free time, Stephen enjoys spending time with his wife, Stephanie, their Dog, Nellie, and their birds - Henri and Gus. Gannon Phillips has a Bachelors Degree in Music Education and has been playing trombone for 18 years. He has been a sought after clinician and guest artist at many schools across the state. 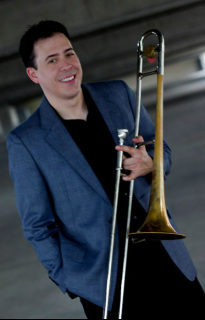 As a member of the Temple Jazz Orchestra, Gannon has performed at the International Association of Jazz Educators conference in New York City with the world renowned trombonist, Bill Watrous. With this group, Gannon has traveled the world playing venues such as the Montreaux and North Sea jazz festivals, various venues across Europe and has performed on two different occasions at the United Nations in Geneva, Switzerland. Gannon has performed on stage with artists including Bill Watrous, Conrad Herwig, Wayne Bergeron, Ed Shaughnessy, Eddie Daniels, Gordon Goodwin, Jeff Jarvis and Randy Brecker. A bass player of 14 years, Gannon is also the former bassist of the Waco Jazz Orchestras and a regular freelance bassist across all genres, in addition to having an active bass and trombone private lesson studio.